We have developed the advanced travel booking script with our last five years of experience in Bus Ticket Booking Script PHP. We have implemented the script with graphical user interface and user friendly features. Redbus Script will help you to find the seat and bus availability searches, through lightweight process of Ajax data loading. We can filter a bus through the modified search option based on bus facilities, bus types, travel dates and service provider. Book the tickets of any bus as in one-way or round-trip with secure transactions over the internet. Admin and bus operator can manage the routes, buses, ticket fair, seating structure, bus features, bus availability, etc. 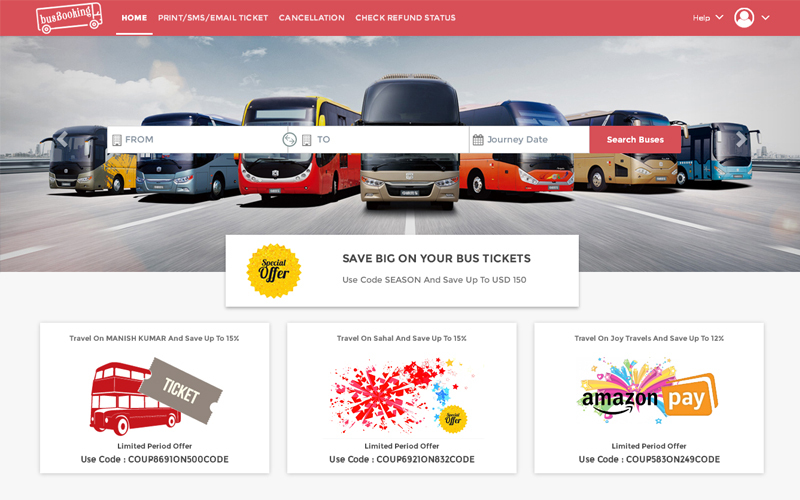 Bus Ticket Booking Script PHP /Online Bus Reservation Script will help you to transform your level to a online Entrepreneur because now a day without travel we can’t imagine our life style. More than 20 Million tickets booked through online. Readymade Bus Booking Software is very essential for any bus owner or bus agent. Add and manage bus admin details. Search by bus type, place and status. I am quite impressed with this script. The developers are friendly and guided me so nicely so that I was able to install this script successfully. I extend my thanks to the team and the company for his wonderful product. It is simply superb to work with this script and they provided everything at my hands readymade so that I was felt very light to own this script. This script has great advantages and it is a good revenue making model. Thank you so much guys.